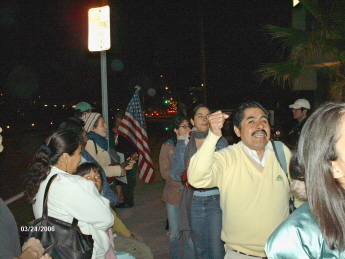 Armed with a mag flashlight outside of El Chinaco, Gilchrist said that his band of border patrolling baby boomers would protest there every Friday “until she [Burciaga] orders her operatives to stop harassing Monahan.” But Burciaga is not involved with the Monahan protests, which are organized by a community group called the Colectivo Tonantzin. But last Friday the Minuteman brigade couldn't be found, at least not at Chinacos, which offered the $1 “minuteman” taco that increased business during Gilchrist's St. Patrick's Day appearance. He gave me the middle finger as I video taped, then pleaded with me to “talk American” with him. “Does anyone speak English,” he asked the crowd. In Hebrew, I answered (transliterated) “Ani medabaer evreet,” which means “I speak Hebrew.” He ignored me, perhaps because he thought I was speaking Spanish. Some of Monahan's regular beer drinking clients claim that the weekly protests have increased business—pointing for proof to the influx of Minutemen who have come to drink since protests began. Costa Mesa business owners are also organizing—over forty held a press conference announcing their opposition to ICE. The city's 489 member Chamber of Commerce also opposes the proposed plan.